In the Media Browser, you’ll notice a button called Slideshow. You also find a Slideshow option in the Create panel. Both options are used to create slideshows that you can export as a movie file and share with friends and family. The other slideshow option you have is to view selected photos as a slideshow on your computer. Naturally, you find this option as a menu command in the View menu. However, the command you want is not called slideshow. Elements provides you with a Full Screen command where you view your pictures in Full Screen view as a slideshow. Select photos in the Organizer and choose View→Full Screen (or press F11). The first photo appears with a tools panel and two panels with various editing options. You can organize, edit transform, tag, and add metadata to your photos while in Full Screen view. 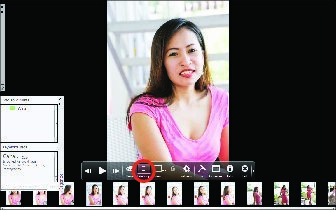 Click the Filmstrip button in the horizontal tools strip and click Organize on the lower-left side to expand the panel. The Full Screen viewer appears. Your photos are displayed as thumbnails at the bottom of the window. Click a photo to jump to the respective image. Keep in mind that Elements provides you with view options when you use various menu commands in the View menu. When you view photos in Full Screen view, you don’t have any export or saving opportunities.